One position that has defined the Three Lakes-Phelps softball team over the past decade has been pitcher. Coach Tony Lorbetske and his teams have been blessed with a number of above-average talents inside the circle, oftentimes helping overcome an evening of less-than-perfect offensive production from game to game. 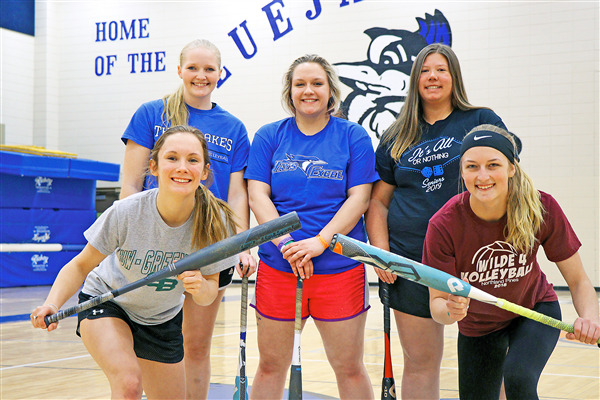 This year though, if the Lady Bluejays want to again be in the conversation for Northern Lakes Conference champions, it’s going to be due to their offense, which after graduating almost 100% of their pitching after last season, will need to shine for the Three Lakes-Phelps girls to hold a candle to the league’s top teams. That offensive threat showed some potential in their first game of the season as the Lady Bluejays posted 12 hits in what was an opening game loss to Tri-County last Friday. With the not-so-spring weather continuing to have a stranglehold on the schedule moving into the middle part of April, nothing is being rushed right now, according to Lorbetske, in terms of Northern Lakes Conference games. Practice time indoors has been a common theme over the course of the last five or so years, said Lorbetske. In game one of the season, Three Lakes-Phelps trekked south to Plainfield where they met Tri-County for their season opener. Rust was evident early though Gabby DalPonte led her year off with a single in the first. She was stranded after a strikeout, sacrifice and grounder put the Lady Bluejays on defense in the bottom of the first. Mari Szews got the start and did well throwing strikes. Tri-County however equaled that effort with their bats, scoring seven in the first and following it up with five more in the second to put themselves up 12-0 after two. Three Lakes-Phelps on their second time through showed some improvements at the plate, again led by Dal Ponte who singled and scored on an RBI single from Tiffiny Ruffie. Behind her was Emily Schmitt who also singled and stole third after Ruffie’s single to move her up 60 feet. She then scored on a passed ball which made it 12-2. Working around a two-out hit batsman, Three Lakes got a quick bottom half of the third to help carry some offensive momentum to the fourth where Emily Vold, Hannah Clough and DalPonte each scored to make it 12-5. The big hit was DalPonte’s third of the day, a two-RBI triple with one out which scored both Clough and Vold. DalPonte would equal that feat in the fifth as again a two-RBI single plated Brooke Brewer and Vold to make it 12-7 going into the bottom of the fifth. Tri-County would then answer with five of their own, ending the game in a shortened five-inning affair with the home team taking a 17-7 decision. Three Lakes-Phelps tallied 11 hits in five innings and had baserunners aboard throughout the game. Aside from the four-hit afternoon from DalPonte, Schmitt had a pair of hits, an RBI and scored a run. Andrea Kieler had a hit and a sacrifice while Ruffie, Brewer, Vold and Clough all had one hit apiece. Defensively, the team played well overall, though a couple of fifth inning errors helped stall the comeback. The team is scheduled to take part in an indoor scrimmage this week at Northland Pines, after which they’ll await the weather to hopefully begin Northern Lakes Conference games next week. To keep up to date on the spring schedule, a full rundown is available online at northernlakeswi.org.